This family owned private home has been upgraded at a cost of nearly $100,000, and is now available for rentals. This property would suit the most discerning guests. Sleeping a maximum of 12-14 guests (Max) in opulent luxury. Large (3000 Sq Ft+) 6 bedroom home with 4 bathrooms, 2 Master en-suites. 3 rooms have king beds ( 2 masters have 4 poster beds), 1 queen room, 1 twin room, and 1 Disney theme room with 2 bunk beds (sleeps 4). Living room sofa also has a queen sleeper. Large South facing, fenced in, extended screened (not overlooked at all) 30'x15' pool with color changing lights. Over-ground 6 person hot tub/jacuzzi with color changing lights. Luxury patio furniture, tile table with 6 chairs (2 swivel rocker chairs), under the large covered lanai area. Outside on the pool deck there is a further table, 4 chairs, 4 recliners and 2 loungers. There are speakers built into the ceiling along with a connection for and iPod or MP3 player, so you can listen to your tunes outside. The lanai has a remote control ceiling fan to cool those hot summer evenings. Custom 16' sliding windows to the breakfast nook/living room. 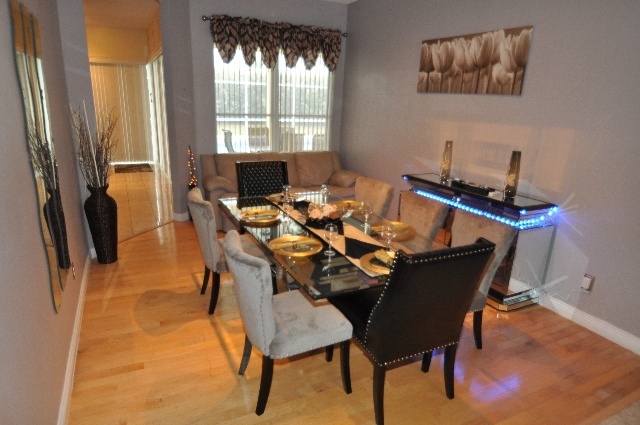 Luxury kitchen with stainless steel appliances, granite counter tops, marble floors, color changing LED mood lighting. There is also a wine chiller and kegerator for draft beer!!! (beer kegs available on request). Granite breakfast nook table with 4 chairs. Living room has 58" plasma TV, with extended HD cable service, blu ray player, and full surround sound with 7 speakers. Dining room with polished hardwood floor and a table with seating for 6. Master bedroom with truly luxurious 4 poster king canopy bed, luxury pillow top mattress and Egyptian 500 thread count sheets. Leading to the luxury master bathroom with marble floors, Jack & Jill granite top vanity sinks, large garden tub and walk in shower. There is a safe in the master closet available for guest use. This room has a wall mounted 42" LCD TV, with DVD player and HD cable. The second master located on the second floor (only room upstairs), also has a 4 poster bed and 42" TV & DVD player. All bedrooms have flat screen TV's, with a further 2 DVD players. All bedrooms also have remote control ceiling fans. All bathrooms have marble floors and granite counter tops. The air conditioning is 3 zone, with separate controls for each of the Master suites, and one for the rest of the home. The home is equipped with free wireless internet, and free phone calls to over 60 countries worldwide. There is also a 24 hour monitored security system for your piece of mind. The fully air-conditioned (dedicated A/C unit) games / theater room is equipped with a full size slate bed pool table along with a HD projector for a 10 ft picture, Playstation 3 games system with blu-ray player, extended HD cable , iPod connection, full Dolby Digital, DTS surround sound system 6 luxury reclining theater chairs, and 2 video rockers for the kids. Complete with Neon Budweiser lights.